The illegal Bainikaiyum 2013 constitution states that the ownership of all Fijian land shall remain with the customary owners of that land and Fijian land shall not be permanently alienated, whether by sale, grant, transfer or exchange, except to the state. Is that the new illegal 2013 Constitution guarantees all indigenous Fijians, Rotumans and Banabans ownership and protection of their lands. BUT in TITLE only. 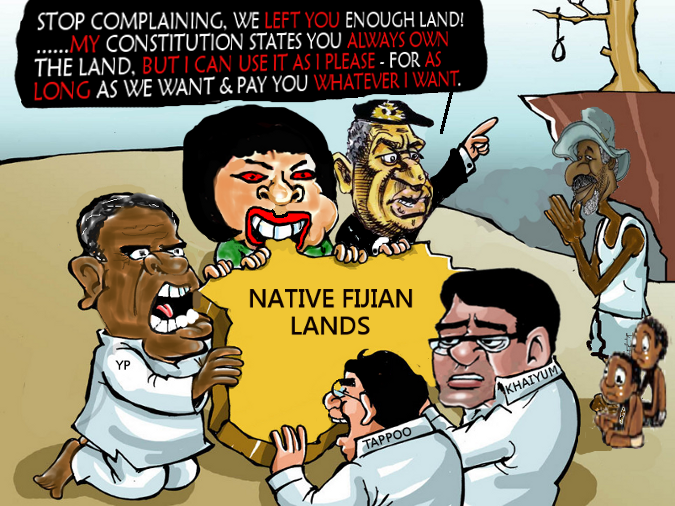 They will ONLY be the legal owners of the land until they have handed it over to Khaiyum and Bainimarama's land-bank. Then they will have lost the lands for ever or until they take action to reclaim it. The CONTROL of the land will remain with Khaiyum until he and his corrupt relatives and friends decide that they no longer have any use for the land. This could be 99 years later, or 99 x 99 years later. Meanwhile the indigenous Fijians, Rotumans and Banabans must accept whatever rents Khaiyum chooses to pay them. This could be as low as $1 per acre or $1 per year. The legal owners will not be able to do a thing about it, should they become unhappy 60 years later, or if their children decide they want to use the lands in 30 years time. When Khaiyum finally decides that he and his corrupt family and friends can no longer profit from the land then they may decide to return it to the customary owners, yeah right! It is more likely that they would lease it to China or some other country or entity for another 99 years. Their customary landowner's ownership documents will effectively be as valuable as toilet paper. What is interesting is that indigenous Fijians will be willing to give their lands away for close to nothing when their communities are in desperate need of quality services, infrastructure and development. It would be stupid to give away land for cheap rents, when instead, their communities could get much needed, and sustainable, services - health, education, clean water and proper sewerage, infrastructure, development and technology. This should be the minimum requirement by indigenous landowners. The land can and should be used in exchange for all necessary services that their communities need, and not just mediocre services but top notch high quality services. This will subsequently improve their communities standard of living and it will be a much fairer return in exchange for giving up control of their lands for 99 years or 99 x 99 years.